3D computer graphics tend to be realistic and explicit. The creation of photo-realistic images by computer has been a long term goal of film industry and academia in computer graphic research (Safarian 2003), and arguably, the goal has nearly been achieved except for certain minor areas such as the realistic human face with expressions. Even this last challenge has possibly been solved as images showed in the recent live-action productions, such as The Curious Case of Benjamin Button (Fincher 2008) and Avatar (Cameron 2009). However, if the purpose of computer graphic is for visual communication or storytelling, 2D graphical style is an alternative approach to create digital art or produce computer animations. The 2D graphical approach can benefit the animation production both aesthetically and economically. Aesthetically, 2D graphical representation has at least no less potential than the conventional 3D geometrical looks. Moreover, the production work of animation decreases significantly without the consideration of re-assembling the details in the real world, especially in the lighting and texturing in the production pipeline. This gives animators and artists more time and energy to develop unique visual styles and to fine-tune characters’ performance. The images created by 3D computer animation techniques to simulate the traditional forms present a unique hybridity. If we inspect 3D computer animations that simulate other animation forms carefully, some subtle variations from the traditional forms still can be spotted. For example, in some scenes of South Park (Stone and Parker 1997-), when characters move toward or away from cameras, the increasing and the decreasing of the characters size show the dimensionality of 3D environments. The slight differences create a hybrid style between cut-out animation and 3D computer animation. In the project of Sophie’s Secret (2008), which is an animated short film produced with 3D computer techniques, I explored the possible approaches to create 2D graphical styles by directly referencing selected traditional animated works. In this paper, I will discuss the visual style ideas and technical issues that have arisen from the practice of production processes. A set of practical strategies to create animation with 2D graphical style by using commercial 3D computer animation packages was introduced. There are certain attempts to produce feature length animations with 2D graphical styles from the original live-action source with the help of advanced computer algorithms. Waking Life (Linklater 2001) and Scanner Darkly (Linklater 2006) were filmed in live-action and then an in-house developed computer program called Rotoshop was applied to modify the footage and give it a painterly appearance. Renaissance (Volckman 2006), a 3D computer science fiction animation, applied motion capture to virtual characters. The film was rendered in a high contrast black-and-white style, which was influenced by the original comic book (Zahad 2006). There are more 2D graphical styles created in short 3D computer animations, and these are usually screened in film and animation festivals. Some of them are produced by small studios to showcase their work; others are created by university students to present their capability in aesthetics and skills. For example, L’Enfant de la Haute Mer (Gabrielli, Marteel, Renoux and Touret 2001) and Le Processus (Grammaticopoulos 2001) are two animated short films that were created by students in SUPINFUCOM, a school in Valenciennes, France. Images in L’Enfant de la Haute Mer were rendered with 3D computer techniques to simulate the appearance of water colour painting (Cantor & Valencia 2004, p. 116). In Le Processus, black-and-white stripy textures are applied on characters and objects to present a woodcut-like visual style. Although the rendering technology and calculating power of computer have greatly increased and the ability to create realistic images have advanced in recent years, the 2D graphical style is still a popular form for the creation of unique styles of short 3D computer animations. In the animation theatre program in SIGGRAPH Asia 2008, five out of seventeen 3D animated shorts were rendered in various 2D graphical forms. In addition to animation shorts, some TV commercials, music videos and game trailers experimented with graphical styles by creatively using 3D computer techniques. For example, PSYOP, a New York base studio, has produced TV spots and music videos that are acclaimed for their concepts and aesthetics. In some of their works, 3D computer technology is applied in combination with graphical design to create unique visual styles. Todd Muller, one director in PSYOP, described the concept in the production of a music video: “we wanted to give it a two-dimensional quality, but still have a lot of three-dimensional dynamics. There was a lot of interplay between 2D and 3D” (Romanello 2005). This ‘interplay’ between 2D and 3D really facilitates the possibilities of artistic performance as displayed in their works. As for game trailer, Monster Farm 5 Circus Caravan (Fujita 2006) is one video produced by Digital Media Lab Inc. In this video, 3D computer techniques were applied to render out 2D graphical images as the approaches used in PSYOP’s TV spots. Both PSYOP and Digital Media Lab took advantage of the 2D graphical styles to play visual tricks. For example, the object in the foreground blocks a character while the camera is moving and the character appears from a different angle or poses in a different location after the blocking object moves away. The hybridity that is presented in my project can possibly be seen as one example of a hybrid aesthetic in contemporary digital art and cinema. The characteristics of hybridization in contemporary film and video have been widely discussed in New Media field. (Burnett 2004; Darley 1997; Hiltzik 2004; Manovich 2001; Safarian 2003). It has been an especially significant phenomenon of imagery creation with the aid of computer technology in the digital era (Crawford 2003). With the power of computer technology, digital filmmakers are able to produce moving images with the mixture of live-action footage, hand-drawn animated frames, digital still images and any other available source that can be converted to a digital format (Lister 2003). There are two levels of the hybridization. One occurs when traditional forms such as photography and cinema are transformed to new digital formats by the aid of computer technology (Darley 2000). The new digital formats allow more freedom of manipulation and further hybridization. The other occurs when previously separated media are merged to form ambiguous digital formats. Jirka (2004) suggests that the aesthetics in current mainstream 3D computer animations are hybridizations of Disney’s styles, live-action and 3D puppet animation. In some animations such as Ghost in Shell 2: Innocence (Oshii 2004) and The Prince of Egypt (Chapman, Hickner and Wells 1998), hand-drawn characters were combined with computer-generated 3D backgrounds and special effects. On the technical aspect, many academic projects in computer science proposed specific algorithms to simulate artistic media. There is a research group called Non-Photorealistic Rendering (NPR), which emerged to focus on the graphical rendering of virtual 3D objects. NPR is a group of rendering techniques of computer graphics to use algorithms to output stylized graphical images that do not resemble the photographs taken from the real world (Strothotte and Schlechweg 2002). The inspirations behind these projects are to emulate traditional artworks such as drawing and painting. Wilson and Ma (2004) combined a geometry-based approach with an image-based approach to simulate pen-and-ink illustration. They proposed a workflow to render out images from 3D objects as reference images at first. The reference images were then calculated with algorithms to extract the silhouette edges. The cross-hatching was finally added in image-based process. Praun, Hoppe, Webb and Finkelstein (2001) have developed a real-time simulation system for pencil hatching. They pre-rendered hatching strokes on texture images and applied them back to 3D geometries. Some large studios developed in-house programs or scripts for specific needs to illustrate 2D graphical styles from 3D objects. For example, the Disney studio has developed a system called Sable to render a painterly appearance for animated projects (Teece 2003). A set of hand-painted brushes are used as a library and mapped on curves that have been attached on 3D geometry. They integrated this system into their production pipeline with other commercial 3D computer program and in-house renderer. The algorithms or specific software provided in these projects to simulate hand-drawn brush and inking are innovative. However, the researches in NPR often focus on a single solution at a time and seldom consider from a broader view of storytelling and visual communication. In many NPR papers, certain styles of paintings or drawings were used as visual references but visual styles of animations were seldom applied as references for technical development. Moreover, the algorithms developed by computer scientists may not easily be applied by designers or artists because of the underdevelopment of user interfaces. From an animator’s or an artist’s point of view, to code program or to develop a specific software are far from the creative process. The approach in this project is to use standard commercial 3D computer software to create similar effects. While many proposed algorithms focused on the simulation of specific traditional hand-drawn techniques such as pencil drawing and watercolor painting, I tried to directly reference traditional animated film. Toon shading, or cartoon shading is a technique to mimic the look of hand-drawn cartoons by creating a black outline around the perimeter of (3D) model, and simultaneously limiting the number of colours on the interior surface of the 3D models (O’rourke 2002). The toon shading technique and functions in standard 3D computer animation are my major tools of production in this project. As previously discussed, the methods I used in this project are to directly reference traditional 2D hand drawn animations and develop a set of strategies and ideas for further application. Certain parts of these visual experiments were consequently applied to the making of the short narrative animation, Sophie’s Secret. In this paper, I do not include the discussion on the overall narrative structure and plots of this short, but concentrate on the special visual styles that have been created through the experiments. Nevertheless, these experiments and strategies did enhance the storytelling in this animated short. I selected visual references of animations produced in traditional 2D techniques as visual references based upon my personal preference as well as the similar spirit of reduction and visual simplicity presented in their works. The economic consideration and aesthetic concept in these animations are very similar to my initial motivation in the animation production. UPA’s (United Production of America) animations, especially Gerald McBoing Boing (Cannon 1950), Japanese anime and a contemporary French animation, Histoire tragique avec fin heureuse (Pessoa 2006), are my primary visual references and inspiration. In the following sections I use these visual references for the creation of a hybrid aesthetic and the induction of a set of visual strategies. From the late 1940s, United Productions of America (UPA) initiated a new aesthetic direction that was different from the dominant Disney style in animation production. Influenced by the early 20th century modern designs in illustrations and architecture, UPA’s artists developed visual styles by integrating the characteristics of abstraction and simplicity in modern design into their animation productions to compete with Disney’s animations (Klein 1996). Different from Disney’s detailed and realistic-oriented approach, images in UPA’s animation are usually simplified and graphically stylised. I chose Gerald McBoing Boing, UPA’s award winning animated short, as my first visual reference. In this animation, all characters were illustrated in simple shapes with outlines. 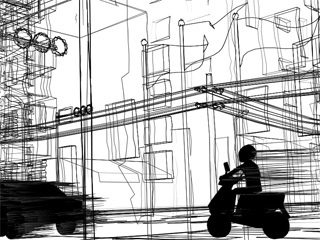 Environmental backgrounds were simplified by removing lines that display perspective such as horizon or skyline. Space was suggested in the film by articles within the frame. The visual experiment in the 3D environment basically followed UPA’s minimum, suggestive space. 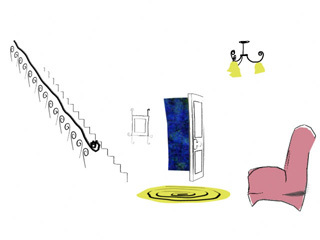 The furniture and decoration in the first scene of Gerald McBoing Boing are characterized with curvilinear design. I tried to create models for furniture with similar curved outlines. The idea is to reduce the complexity of characters and background designs to simplify the production process and facilitate an effective expression of ideas. In this experiment, 3D objects are rendered by using toon shading techniques for a flat, graphical appearance with outlines. Many objects are rendered in a white colour to blend into a plain, white background. 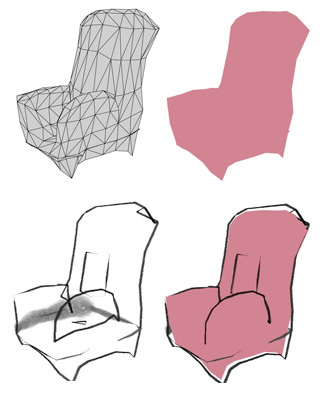 Figure 1 shows the wireframes of 3D geometry and rendered images, in which only outlines are read. Camera movement was conducted in this test to examine the perception of space in a 3D virtual environment. Some objects placed in virtual space were rotating while the camera is moving. Since there are no clues for three-dimensional perspective, the rotation of these objects is not easy to be sensed. This will give the animator more freedom to obtain a desired angle by slightly adjusting the objects in 3D spaces. In this experiment, I used a system to procedurally generate outlines and shapes of 3D objects in a commercial program to simulate a hand painted brush effect. While Disney’s Sable system used scanned hand painted brushes as a library, this system procedurally created brushes in the 3D program for application. These brushes can be manipulated or further animated to simulate the brush variation between frames in an animation. 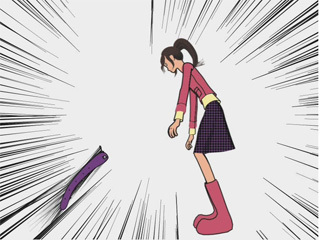 Character’s special emotions such as anger or fear are also able to be expressed through, for example, animated wiggling brush lines. In Gerald McBoing Boing, lines and inking shapes of several objects are intentionally offset. To emulate this effect, I created two 3D models for a single couch. One is for the display of outlines and the other is for inking shape. The geometry for inking shape also covers undesired brushes (Figure 2). Anime, or Japanese animation, has gained increasing popularity in worldwide scope in the last two decades. The popularity of anime is increasing in Western society for its distinctive aspects ranging from narrative to visual styles (Napier 2005). There are some visual conventions and special styles have been established for the efficiency of storytelling during the history of anime production development. Visual conventions are ‘not just limited to obvious cultural details but are unique stylistic ways of communicating and expressing feelings and ideas’ (Poitrais 2001, p. 59). Many conventions originally developed by artists for manga (Japanese comic book) were applied to anime. The reason is probably that many anime shows are adapted from popular manga. The most obvious anime convention regarding character design is the large eyes. I used this convention in the character design for the protagonist in Sophie’s Secret. One anime convention that I applied in this project is the use of special objects such as flowers and sparkles to replace the characters’ backgrounds. This is done to express the characters’ emotions, especially the awakening of a love interest (Poitrais 2001). These alternative backgrounds that consist of special objects can also change drastically to demonstrate the sudden emotional change of a character for storytelling purposes. It is especially convenient in 2D cel and line animation among other traditional animated forms, because foreground characters and the background are usually drawn in different layers. These arbitrary backgrounds can be re-used for different characters when they have the same emotions. 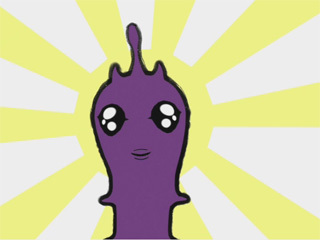 In Figure 3 (a), the sun with radiation in the background presents the attractiveness of the worm with a cute face. In Figure 3 (b), which is the next shot, the flowers in the background behind Sophie, show her feelings of affinity to the worm. The background is changes with the mood of the shot. Another visual convention in anime is using streaks in the same direction as the background to show the speed of a character. Streaks can also be drawn on the opposite side of the character’s moving direction to show the speed. In live-action footage, motion blur is a phenomenon where images of objects appear blurred when they are moving fast during the recording by a camera (Kerlow 2003). Blur effects for fast-moving objects are added as a touch to enhance the realism in many 3D computer animations. In 2D cel and line animation, images are recorded statically frame-by-frame under the camera so blur effects of fast-moving objects do not appear. However, the speed is expressed though the lines on the opposite direction of the fast-moving object. This technique is called ‘dry brushes’ (Herbert 2004). I applied 3D computer techniques to create these ‘dry brushes’ effects in the visual experiments of this project (Figure 4). Realistic movement of hair and clothes is also a visual convention of anime that I applied in this animation. I used dynamic simulation in 3D computer software to create these realistic movements. Dynamic simulation is a 3D computer animation technology that generates realistic motion of objects by simulating their physical properties and the natural law (Kerlow 2003). The contrast between the realistic movements and 2D graphical texture creates a unique visual look as images shown in Figure 4 and Figure 5. The textures are projected perpendicular to virtual camera on the signboards of the buildings in Figure 5. Dynamic simulation is applied for the movement of flags on the street in Figure 4 and the steams discharging from the exhaust on top of a building in Figure 5. Speed lines or dry brushes are applied for the cars running on the street. 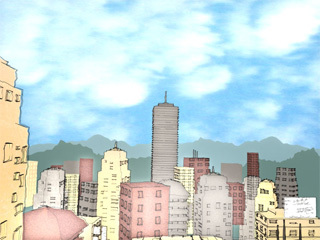 The geometries of buildings in this scene were randomised to break the perfection of 3D computer generated images. Another visual convention of anime I applied to my animation is the cross-dissolve of action. Instead of using a continuous action, several still images are cross-dissolved to show the progress of this action. In anime, this is not only applied to save the number of drawings but also emphasize the uniqueness of the moment. 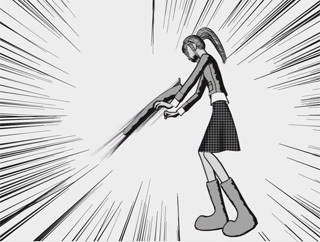 I applied this cross-dissolve action when the worm penetrates into Sophie’s body in the story since this is an important moment for the story. During these cross-dissolved images, the images of the shot transit from colour to black-and-white to indicate the change of mood in the story. In Figure 6, I used toon shading techniques to create lines on the worm in the opposite movement direction to present its speed as a simulation of ‘dry brushes’ techniques. The same technique was used to create lines in the background to emphasize this action. The visual style in Histoire tragique avec fin heureuse was the major inspiration for the creation of the environment in this scene. This is a 2D animation produced with the support of the National Film Board of Canada. 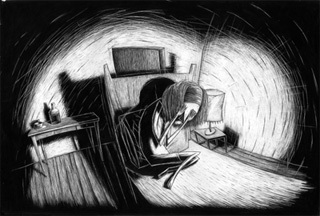 The unique black-and-white, woodcut-like style inspired me to create the visual look of this room to express Sophie’s panic and anxiety as she struggles to pull the worm out. 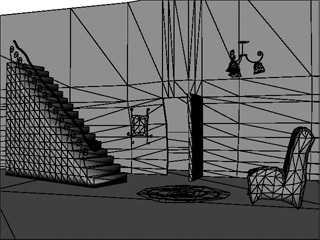 Before the production, several visual tests were conducted to resemble the similar visual style. In the first test, I created a model of a fish with very simple geometry, and animated it to swim through the path of a close curve and made this animation a loop. I experimented with procedure textures for the creation of the shape of this fish. Procedural textures are images created by algorithms in 3D computer software without any involvement of photographs and hand paintings (Kerlow 2003). The patterns of procedure textures are often pseudo-random or rhythmic so they are now only subordinately used for realistically oriented 3D computer animations. However, the abstract, pseudo-random and rhythmic characteristics of procedure textures can be useful to create 2D graphical styles. Moreover, the procedure used to experiment with visual styles created by procedure textures is flexible and efficient since the attributes of these textures can be modified in the same 3D computer software. I experimented with many different types of procedure textures and kept successful results. These results were further applied in the animation production. One of the satisfactory results is shown in the Figure 7. The visual style resembles the appearance of artwork created by the wood-cut technique. Another technique that I applied for the same fish model is the particle system to further experiment with visual styles. The particle system is a 3D computer tool that is often applied to create motion for natural phenomenon such as snowing and the flow of liquid (Kerlow 1003). Particles do not have specific shapes or volume in 3D computer programs, but they can be used to control or interact with 3D objects. The behaviour of particles is calculated by computer algorithms according to physical laws, and the result is used to create motions such as collision or turbulence. In this test, dynamic, watercolour-like styles were created with the application of the particle system. 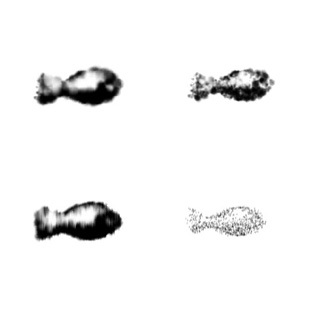 A simple black-and-white procedure texture is mapped onto the fish model as in the previous test. I then set up particles to be emitted from the surface of the 3D model. The attributes such as shapes and size for the particles were adjusted to achieve satisfactory result. The particle colour is set to base on the colour of the surfaces that emits them. I also modified the size, transparency and the lifespan for the particle system to achieve desirable appearances. Figure 8 shows the result of some satisfactory results of this test. 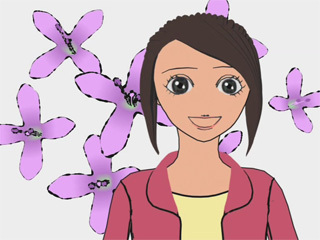 The result of the visual tests was then applied into the animation production. The comparison of the reference image and a frame created for the animated project are displayed in Figure 9. 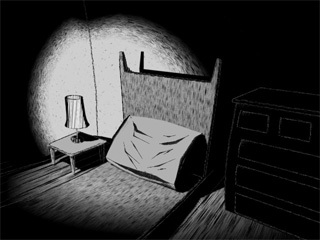 It should be noticed that some shadows in Figure 9 (b) such as the patterns on the walls and the shadows of the bed are textures on the 3D surfaces but not automatic generated shadows of lights in the 3D space. The automatic generated shadows are visually undesirable and difficult to control in this case. Fluid simulation is also a tool of 3D computer animation software to simulate the fluid. I used this technique to create watercolour and smearing effects. The image in Figure 10 (a) is original output image from 3D computer program by using toon shading. 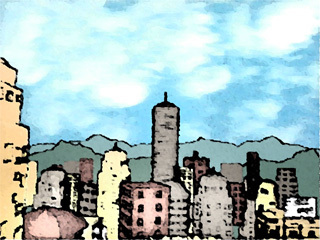 I then applied watercolour filter in Photoshop to modify the image as shown in Figure 10 (b). The batch mode was used to modify each frame for an animated sequences. These images were brought back into the 3D computer program and applied the fluid simulation to further modify images as shown in Figure 10 (c) as the final appearance. As with traditional 2D animation, reduction can be achieved through eliminating unnecessary details. Background setting can be reduced to a minimum. Animators can concentrate on the performance of characters and overall aesthetic composition. Randomness is the principle that can be applied to eliminate the perfect, geometrical appearance of computer graphics. Randomness and imperfection are also principles for realistic-oriented 3D computer graphics that may be applied to simulate the dirty, messy real world. For a graphical representation, the principles are applied to simulate hand-drawn strokes and paintings. Quality of lines and shapes are of major importance in attempting to create 2D graphical appearances in 3D computer processes. This is very different from the concern of lighting and other physical rules used in conventional 3D computer animation to create a realistic appearance. Manipulation of the quality of characters’ outlines can express the characters’ emotion. For example, shaky outlines can be applied to show the fear of the character. The use of 3D computer production with 2D graphical styles enhances and creates new possibilities of visual effects in relation to the transition between spaces, since images are not bound by realism as shown in some PSYOP TV advertisements. The dramatic change of a scene’s visual style, for example lines/shape/colour quality altering, has a minor influence on the consistency of 3D computer characters, as the 3D models remain structurally constant. Therefore, visual styles can be explored and modified in some or all parts of the story, without the need to consider consistency issues. These described modifications are merely superficial. Objects do not necessarily have to be three-dimensional in construction if they are graphically rendered. This advantage enables some visual effects or tricks. For example, eyes do not necessarily have to be constructed as spheres within the model of head. They can be two 2D planes that are attached on the surface of the head model. They can be removed or resized while the body is unchanged. For example, the eyes of the worm and the girl in Figure 3 are two-dimensionally constructed. Dynamic simulations for the movement of hair and clothes for characters that are graphically rendered create a contrast of realism and graphical quality to achieve an interesting visual look. Producing 3D computer animations with visual references to animations that are produced in other media, creates images with hybrid aesthetics. 3D computer programs are able to simulate the visual styles of other animation forms. However, the intrinsic differences between 3D computer techniques and traditional techniques can create hybrid visual styles that are in between 3D computer animation and the animation form it simulates. For example, the visual style in South Park (1997-) and the Sophie’s Secret project. Texture images can be projected to 3D virtual camera for some 3D objects to break the dimensionality of 3D spaces. For example, the flatness of buildings is shown in Figure 5. The simulation of the ‘dry brush’ with 3D computer techniques can be applied to express the speed of objects or characters with 2D graphical styles as shown in Figure 4 and Figure 6. Derived from anime traditions, using special backgrounds for characters is a storytelling device to express special moods of story or the emotions of characters as shown in Figure 3. Manipulation of the quality of characters’ outlines can express the characters’ emotion. For example, shaky outlines can be applied to show the fear of the character. 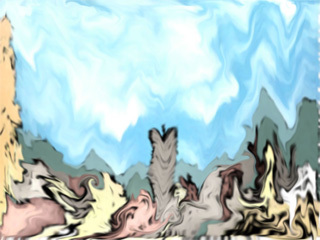 Fluid simulation in 3D computer software can be used to create watercolour-like effects or smearing effects as shown in Figure 10. In this paper, I sum up a set of strategies for the creation of a hybrid aesthetic in 3D computer animation by directly referencing traditional 2D animations. The initial idea is to reduce the complexity of a 3D computer environment into a simple graphical world, however the final outcome achieves a hybrid aesthetic between 2D and 3D. 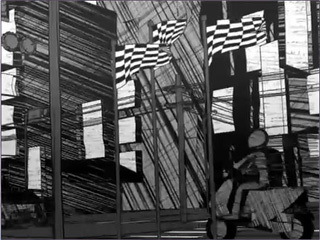 The processes of visual experiments and the images created in these experiments and animation production are presented in this paper. The introduced strategies and ideas are a general concept and are not specifically bounded with any software and technical application. They can be further developed and adapted according to the need of animation production for storytelling and visual communication by artists, researchers or studios who would like to produce animations with 2D graphical styles in 3D computer environment. The images and animated short presented in this paper is a part of my PhD study in RMIT University, Australia. I would like to express my appreciation to my senior supervisor, Dr. Marsha Berry, and my second supervisor, Dr. Dan Torre, for their kind support. I would also like to thank for the support from the Ministry of Education, Taiwan and National Science Council, Taiwan under the project number: 100-2410-H-026. Yen-Jung Chang was born in Taipei, Taiwan. He studied in School of Film and Animation in Rochester Institute of Technology, USA. After graduation, he worked as an animator in Buffalo and Los Angeles. He went to study in the school of Creative media in RMIT university, Australia and was granted a PhD in 2009. He is interested in the research of animation aesthetics, visual storytelling in animation and animation history. The paper was presented in The 11th IASTED International Conference on Computer and Imaging (CGIM) in Feb 17-19, 2010, Innsbruck, Austria. Cameron, J (2009), Avatar, 20th Century Fox, USA. Cannon R (1950), Gerald McBoing Boing, United Production of America, USA. Cantor J and Valencia, P (2004), Inspired 3D short film production, Thomas Course Technology, Boston. Chapman, B, Hickner, S and Wells, S (1998), The Prince of Egypt, Dreamworks SKG, USA. Crawford, A (2003), ‘The digital turn: animation in the age of information technology’ in M Harrison & CA Stabile (eds), Prime-time animation, Routledge, London. Darley, A (1997), ‘Second-order realism and post-modernist aesthetics in computer animation’ in J Pilling (ed. ), A reader in animation studies, John Libbey, Sydney. Darley, A (2000), ‘Simulation and Hyperrealism’ in Visual digital culture: surface play and spectacle in new media genres, Routledge, London. Fincher, D (2008), The Curious Case of Benjamin Button, Warner Bros. and Paramount, USA. Fujita, G (2006), Monster Farm 5 Circus Caravan, Digital Media Lab Inc., Japan. Gabrielli, L, Marteel, P, Renoux, M and Touret (2001), L’Enfant de la Haute Mer, SUPINFOCOM, France. Grammaticopoulos, P (2001), Le Processus, SUPINFOCOM, France. Herbert, M (2004), ‘Fast animation and motion blur’ in Animatrix, vol. 13, pp.37-45. Hiltzik, M A (2004), ‘Digital cinema take 2: computerized postproduction is silently transforming the movies and giving filmmakers a whole new set of challenges’ in Living in the information age : a new media reader, 2nd ed., Wadsworth/Thomson Learning, Belmont, Calif. and London. Jirka, J (2004), ‘Hybridization of animation and design in the electronic age’, Animatrix, vol. 13, pp. 47-57. 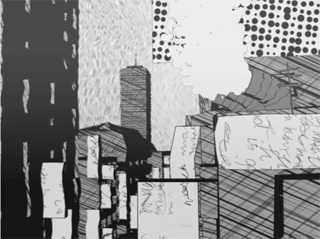 Klein, N (1996), Seven minutes: the life and death of the American animated cartoon, Verso, London and New York. Kerlow, I (2003), The art of 3-D computer animation and effects, John Wiley, Hoboken, NJ. Linklater, R (2001), Waking Life, 20th Century Fox, USA. Linklater, R (2006), A Scanner Darkly, Warner Bros., USA. Manovich, L (2001), ‘Digital Cinema and the History of a Moving Image’ in The language of new media, MIT Press, Cambridge, Mass. Napier, S (2005), Anime from Akira to Howl’s moving castle: experiencing contemporary Japanese animation, Palgrave Macmillan, Basingstoke, Hampshire, UK. O’rourke, M (2002), Principles of three-dimensional computer animation: modeling, rendering, and animation with 3D computer graphics, Norton, New York. Oshii M (2004), Ghost in Shell 2: Innocence, Bandai Visual Company, Japan. Pessoa, R (2006), Histoire tragique avec fin heureuse, Folimage Valence Production, France. Poitrais, G (2001), Anime essentials: everything a fan needs to know, Stone Bridge Press, Berkeley, CA. Praun, E, Hoppe H, Webb M and Finkelstein, A (2001), ‘Real-time Hatching’ in SIGGRAPH 2001 Computer Graphics Proceedings, ACM, New York. Romanello, L (2005), ‘PSYOP: masters of the moving image’ in Studio Monthly, 2005, 27(11), 32-34. Safarian, K (2003), ‘Flashing digital animation: Pixar’s digital aesthetic’ in New media: theories and practices of digitextuality, Routledge, New York. Solomon, C (2005), ‘And the Debate Goes on! What Today’s CG Artists Can Learn From 2D?’ in Animation Magazine, September, 2005, 14-15. Strothotte, T and Schlechweg, S (2002), Non-Photorealistic Computer Graphics: modeling, Rendering and Animation, Morgan Kaufmann, San Francisco, CA. Teece, D (2003), ‘Sable – a Painterly Renderer for Film Animation’ in International Conference on Computer Graphics and Interactive Techniques, ACM SIGGRAPH 2003 Sketches & Applications, ACM, New York. Volckman, C (2006), Renaissance, Onyx Films, France. Wilson B and Ma K (2004), ‘Rendering Complexity in Computer-Generated Pen-and-Ink Illustrations’ in Proceedings of the 3rd International Symposium on Non-photorealistic Animation and Rendering, ACM, New York. Zahad, R (2006), ‘The art of a black-and-white Renaissance’ in Animation Magazine, 2006 July, pp.16-17. This entry was posted in Volume 6, Yen-Jung Chang - Strategies for a Reduction to 2D Graphical Styles in 3D Computer Graphics with Hybrid Aesthetics and tagged 3D Computer Animation, Computer Graphics, Digital Art, Non-Photorealistic Rendering, Toon shading. Bookmark the permalink.